FAYETTEVILLE, Ark. 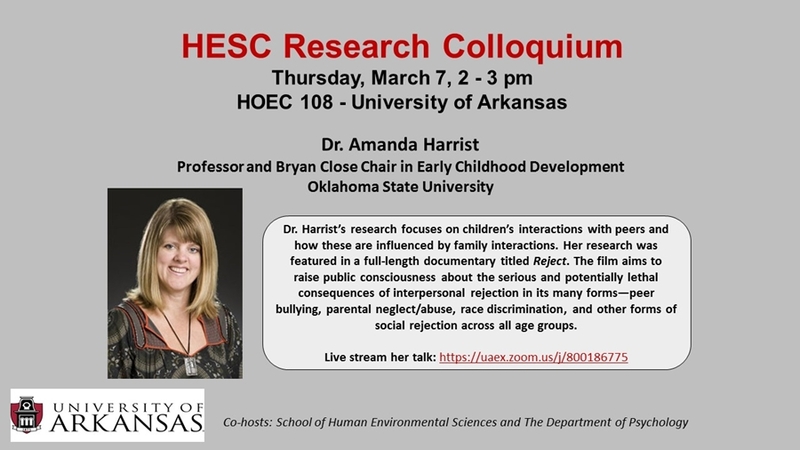 – The bullying documentary Reject and a guest lecture by early childhood educator Amanda Harrist are scheduled for Thursday as part of the School of Human Environmental Sciences' Colloquium series. Harrist's research is featured in the documentary. Her lecture is 2-3 p.m. Thursday, March 7, in HOEC Rooms 108-109. The film screening is 6-8 p.m. in the Union Theater. Both events are free and open to everyone on campus. The presentation by Harrist, a professor at Oklahoma State University, will be live streamed here. Reject takes a science-based and solution-oriented look at the roots of bullying behavior and violent behavior against self or others. The film aims to raise public consciousness about the serious and potentially lethal consequences of interpersonal rejection in its many forms - peer bullying, parental neglect (or abuse), race discrimination and other forms of social rejection across all age groups. The documentary is for parents, teachers, administrators, organizations that train teachers, coaches, mental health professionals, clergy, counselors, juvenile judges, office managers and anyone entrusted with influence over others and in a position to foster acceptance, inclusion and social connection. Experts in psychology, education, medicine, neuroscience and juvenile justice who have studied "rejection" in their respective fields provide commentary in Reject, including Harrist. Her research focuses on children's interactions with peers and how these are influenced by family interactions. Following the screening, a panel will discuss bullying. Panel members include Harrist, Michelle Schaecher, a licensed clinical social worker also featured in the film; Tim Cavell, a faculty member in U of A’s Department of Psychology; and Amanda Williams, assistant professor of HESC’s human development and family sciences program. The School of Human Environmental Sciences, housed in the Dale Bumpers College of Agricultural, Food and Life Sciences, and the Department of Psychology in the J. William Fulbright College of Arts and Sciences are co-hosting both events. For more information, contact Jacquelyn Wiersma-Mosley at jwiersma@uark.edu.